The rebel flag is no more. 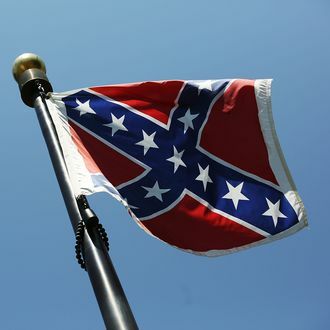 The House of Representatives voted on Thursday to remove the Confederate flag from cemeteries run by the Department of Veterans Affairs, the Huffington Post reports. The House passed the measure 265–159, with the yeas comprising 84 Republicans and all but two Democrats. The House’s Republican leadership — Majority Leader Kevin McCarthy, Majority Whip Steve Scalise, and Conference Chair Cathy McMorris Rodgers — voted for the amendment. According to Roll Call, the amendment was attached to a spending bill for military construction and veterans’ affairs and prohibits the use of federal funds to display Confederate flag imagery in VA cemeteries. Last year, controversy over the Confederate flag caused chaos in the House after GOP leaders withdrew a spending bill rather than suffer the embarrassing spectacle of their fellow Republicans voting in favor of allowing the flag to fly at federal cemeteries. House leadership despaired of the optics of voting to preserve the flag just a month after the horrific mass murder of nine black parishioners at a church in Charleston, South Carolina, by white supremacist Dylann Roof — a tragedy that led South Carolina to finally remove the flag from its statehouse. House Speaker Paul Ryan expressed satisfaction with Thursday’s vote, and although he did not vote on the amendment himself, he’s made recent public comments denouncing the symbolism of the Confederate flag and suggesting it has no place in the Capitol. California representative Jared Huffman, the amendment’s sponsor, issued a statement afterward expressing dismay at how many of his colleagues had voted against it. “While I appreciate that today’s vote represents progress, it is shameful that two thirds of the House Republican Caucus voted against this commonsense measure,” he said.